Because of the bad people at Time Warner Cable in New York City, we were unable to order the Mayweather-De La Hoya fight Saturday night — the customer service guy, obviously beaten down by talking to countless frustrated customers like us, actually thanked us for not yelling at him — but from all accounts, it was a thrilling fight that might have been closer than some people realize. 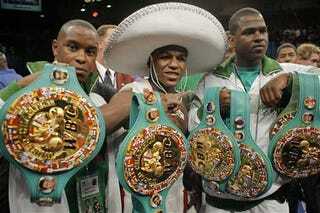 But the best part for us, without question, was Mayweather's decision to enter the ring, on Cinco de Mayo, against Oscar de la Hoya, wearing a wearing a huge sombrero. That, friends, takes intestinal fortitude.